Root rot occurred in places again during the past season. 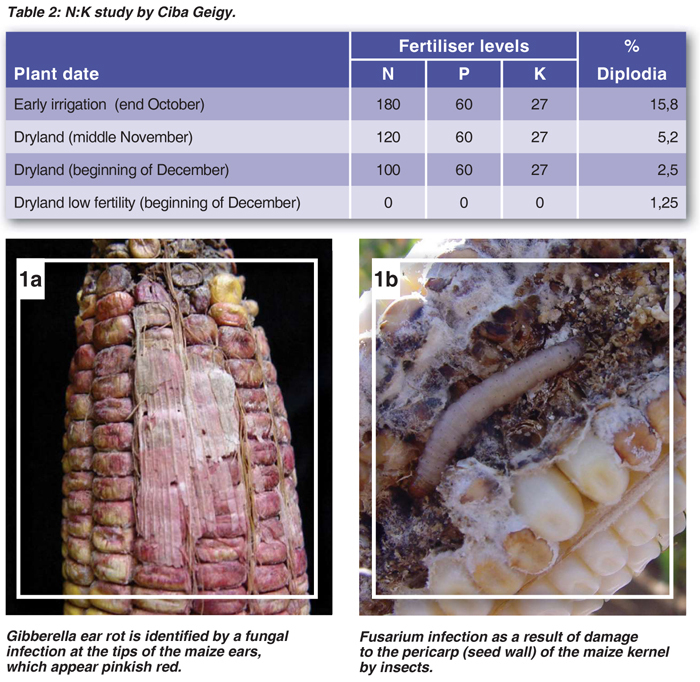 Three main forms of root rot exist in maize in South Africa, namely diplodia and two derived from Fusarium- related fungi. Diplodia is caused by a fungus, Stenocarpella maydis, and the Fusarium root rots are caused by Fusarium verticiliodes and Gibberella zeae (Fusarium graminearum). It is also important for the difference between the different forms of the disease to be known, as the infection and control of the types of root rots differ greatly. Basically, diplodia starts at the peduncle and base of the maize ear, while Fusarium is the result of damage to the pericarp (kernel wall) of the maize kernel by insects like the bollworm. Gibberella ear rot is identified by a fungal infection at the tips of the maize ears, which appear pinkish red (Photo 1a and 1b). The focus of this article is on the occurrence of diplodia, and in particular on the role of imbalances between nitrogen and potassium. The physiological concept of a plant’s demand for sugars (deposit need) of the maize ear in particular should be understood. Any plant has a need for sugars and as soon as seed is formed, the need will increase drastically. Bigger plants and those with a higher yield potential will naturally also have a greater need for sugar compared to a smaller plant or a plant with a lower potential. The better the plant’s early development, the higher is the need for sugar. If a plant cannot meet the need for sugar, the sugar in all the plant's cells is therefore low. This type of disease is related to stress somewhere in the plant. Stress conditions can arise when an imbalance develops in the supply and demand of sugars in the plant. 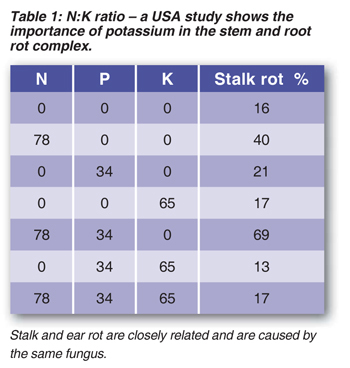 When insufficient K is given or where there is a major imbalance in the ratio between N and K, the dramatic effect this has on the occurrence of stalk rot and diplodia is visible (Table 1 and 2). A further fact is that fertilisation is usually omitted in soybeans, which remove enormous amounts of K. Although crop rotation has a very positive effect on the occurrence of diseases like Diplodia, a nutrient deficiency, particularly of K, can counteract this benefit. Keep the atmospheric fixation of N in mind, as this can lead to an even greater difference in the N and K ratio. The tables indicate that if the need for N and K is great, like in the event of irrigation, an imbalance here will lead to a greater risk of ear and root rot. In the case of poor fertility and a low need by the plant, the incidence of diplodia was particularly low as a result of a low nutrient demand (Table 2). An improvement in the N:K balance will reduce the risk of diplodia infection. This also provides better standability. Through band placement in the root zone the K is more available to the plant. Broadcasting of K leads a lower concentration over a larger area, but less disease does not necessarily follow. A N:K ratio of greater than 3.5:1 can increase the risk of diplodia. Keep in mind that high levels of N with adequate K and P levels do not necessarily increase the risk of diplodia. If sufficient quantities of N were administered but were lost through denitrification or leaching, this can lead to a greater risk of diplodia. This can rather be attributed to the stress condition than just to the imbalance that developed. Article submitted by Pieter Rademeyer, Chief Agronomist, Pannar Seed. For more information, send an email to pieter.rademeyer@pannar.co.za.